Looking for a unique gift? Check out the gift trays of scrumptious goodies available at Larson's Bakery. 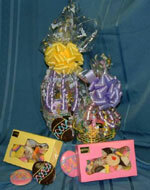 We offer three sizes of trays filled with assorted bars or assorted cookies or a combination of both bars and cookies. 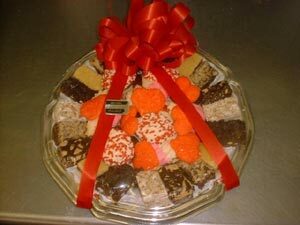 Gift trays can be ordered anytime during the year. If you need more than five gift trays, though, you'll need to order ahead. Larson’s Bakery uses only fresh ingredients in our products and NO preservatives. When you take home any of our delicious treats, make sure they are consumed within three or four days. Generally, seasonal products are available about one month prior to the holiday. Larson's Bakery offers so many Christmas treats that we had to put them on their own page.